This course will examine the impact of social media networking in society and how to think strategically about social media platforms. Specifically, this course will provide students with an understanding of a professional approach to using social media tools in their field. We will examine both the technological and theoretical perspectives of social media through the hands-on application of the technologies and through reading scholarly writings. Students will be required to complete significant writing assignments, data collection, and formal presentations. For this course, students will create an account on the microblogging platform Twitter and complete assignments using Twitter throughout the semester. Students will use the hashtag "#srusm" for your tweets related to the course, including current events and responses to in-class discussions. Students will also be responsible for creating and moderating a one-hour long Twitter chat related to social media using the hashtag "#srusmchat." The instructor will share current events and resources throughout the semester, which students will be responsible for reading and/or responding too. In addition, the instructor will provide in-class instruction on how to utilize Twitter for professional development. What functionalities does it provide? Any other special features to it? Examples of how brands use it? LinkedIn is a great social networking websites for building and maintaining professional connections. Students will be responsible for setting up and completing their own profile page on LinkedIn. It is important for you to begin developing your professional identity online and networking with individuals in your industry as you begin pursuing internships and jobs. Beyond the profile and connections, you should begin exploring the different components LinkedIn has to offer, as we discussed in class (Jobs, Groups, etc.). For this assignment, students will focus on a case involving social media and a company/brand. There will be no repeats of cases, so it will be a first come, first serve basis for sign-ups (on the discussion board). In addition, you will be responsible for preparing a five-minute PowerPoint presentation to present your case to the class. The presentation will cover a lot of the major points relevant to the case with appropriate visuals (similar to the Domino’s case study I presented in class). For this campaign, you are going to develop a social media campaign for a real-life client selected by the instructor. The client will come into class to provide students background information about their company/organization and the reason they want to pursue social media as an outlet, as well as answer any questions the students may have in order to develop your campaign. Students will have three weeks to produce a campaign to meet one or a few of the goals the client is trying to accomplish using social media. This includes identifying: goals/objectives; target audience; content strategy; and content calendar. For the final project, each group will put together a social media strategy for a real client or fictional brand created by the group. In a typed paper and PowerPoint (or Prezi) presentation, you will provide your findings and strategy for your brand. You will be required to take the knowledge you have obtained from class and apply it in practice. This will require you to research what other related brands/businesses in surrounding cities are doing, and deciding how to best use each of the technologies. The final document and presentation should describe the process from beginning to end. Identify who will be responsible for maintaining this presence. Current staff members or a firm? How will these tools be integrated with the current web presence? Do you have different launch phases? What are the metrics & ROI? This is not all of the things you need to include. As the semester progresses and you research, you will begin to notice other trends and considerations to include in your campaign. You will NOT be setting up accounts for anything! You will only mention the website and details on how it will be implemented. The report will be a 15-25 page paper (APA style) describing the entire campaign from start to finish. The paper should include a title page, table of contents, introduction, clearly defined sections (getting started, timeline, graphs, charts, etc.) and a conclusion. Any visuals you deem appropriate should be included. Note: The title page, table of contents, references and appendix does NOT count as your 15-25 pages. Also, you will need to include a bibliography of research and sources & about page (which do not count in the 15-25 pages). The about page will include each group members name, short bio and their contribution to the campaign. For the presentation, your group will provide an overview of your campaign and findings. The presentation should be at least 10-15 minutes long and have accompanying PowerPoint or Prezi presentation, which you will use during your presentation. PowerPoint slides or Prezi link should be submitted to me electronically prior to the start of presentations. PowerPoint slides should include any information you deem appropriate to explain your campaign and may include graphs, charts, etc. Again, if you created a brand, it should be represented in the design of your slides. Each person in your group will be responsible for presenting a portion of your campaign. The presentation should be treated as if you are giving a professional presentation, so please dress accordingly. As for the grading, each student will be graded separately for his or her contribution to the final presentation. With this in mind, make sure to divide the presentation up as evenly as possible. This will put accountability into account for each student, so each group member can finish with different final project grades. 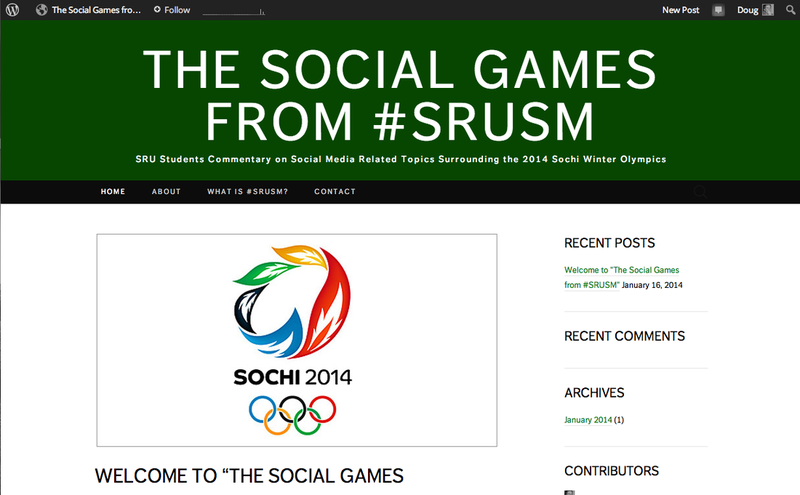 This blog will make the connection between the concepts taught in my course and the use of social media during the Olympics.